Kick off your visit on the 5th (Wed): relax and rejuvenate at some of the best spas, then let the river carry you with a rafting and tubing tour, and then contemplate in the serene atmosphere at Sri Venkateswara Swamy Temple. To see more things to do, ratings, reviews, and tourist information, you can read our Rishikesh online tour planner . New Delhi to Rishikesh is an approximately 2.5-hour flight. You can also drive; or take a train. Finish your sightseeing early on the 6th (Thu) so you can drive to Nainital. On the 6th (Thu), stroll around Eco Cave Gardens, then examine the collection at Jim Corbett Gurney House, then look for gifts at The Pahari Store, and finally contemplate in the serene atmosphere at Goddess Naina Devi. Here are some ideas for day two: contemplate the waterfront views at Nainital Lake and then learn about wildlife with up-close encounters at High Altitude Zoo. 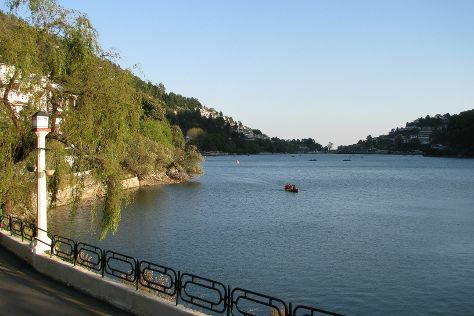 To see photos, maps, more things to do, and tourist information, read Nainital trip planning app . Traveling by car from Rishikesh to Nainital takes 5 hours. Alternatively, you can do a combination of bus, train, and taxi; or take a bus. Finish your sightseeing early on the 7th (Fri) so you can travel to Jim Corbett National Park. For maps, where to stay, photos, and other tourist information, use the Jim Corbett National Park route site . Explore your travel options from Nainital to Jim Corbett National Park with the Route module. On the 8th (Sat), you'll travel back home.